William Allen Hillis was a true renaissance man of the turn of the 19th Century. Born January 6, 1860 in Grandcastle, Indiana, he began an 80 year adventure that would include the life of a trapper, hunter, prospector, miner, sharpshooter, writer, actor, entrepreneur and inventor. His story epitomizes the character of the early men who built the foundation and established the spirit of our country. Yes, I’m afraid I’m one of those responsible for cleaning the buffalo out of Montana. In the latter 1870s and early ’80s, I was one of the bunch of hunters and trappers who made their headquarters at Fort Benton and their hunting grounds the northwestern portion of Montana, where the buffalo, chased from the surrounding country, made his home all the rolling prairie. We made money in those days, but cleaned up the last of the vast herds in the summer of’1882. After Hillis and a companion narrowly escaped death rafting part of the supplies down the Kootenai, the two joined the other partners who had taken the horses overland. The entire party went to work on the mining claims located 10 miles of what is now the town of Libby. Through the years, the Shaughnessy Hill diggers used more hard labor and funds than ore could cover. Hillis married a Libby woman and went into tire the estate business. In 1904, upon his return from Mexico, he went to work for Remington Arms Company. 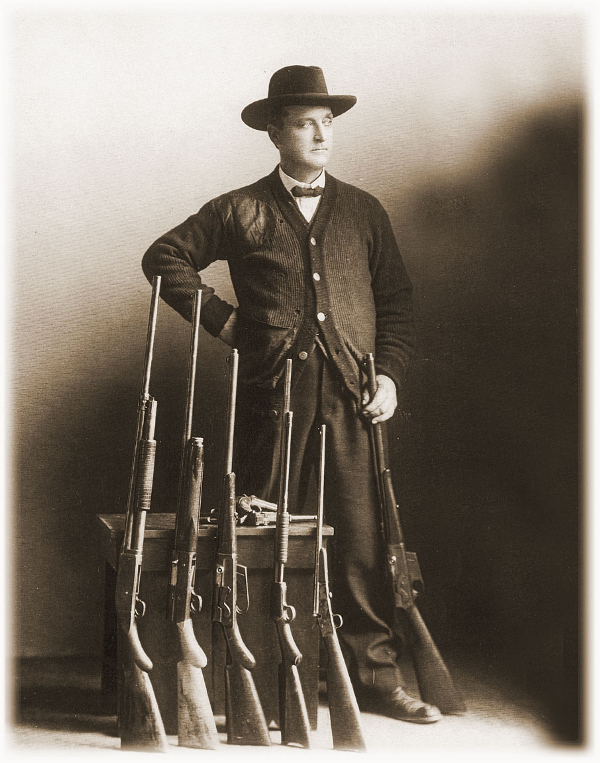 At this time his reputation as an expert with all types of firearms, and his well publicized hunting adventures in Montana and Alaska earned him a national reputation that Remington appreciated and sought to utilize to market its products. For the next 20 years, Bill would travel the world putting on shooting exhibitions promoting Remington products and those of Union Metallic Cartridge Company. In addition, Remington financed many of his hunting adventures which were widely reported in numerous publications. He is a tall, broad-shouldered, rugged specimen of manhood, with a jovial face and manner and a man would be apt to under-estimate his fighting qualities if he had never seen him hit a marble the size of a pea thrown into the air. 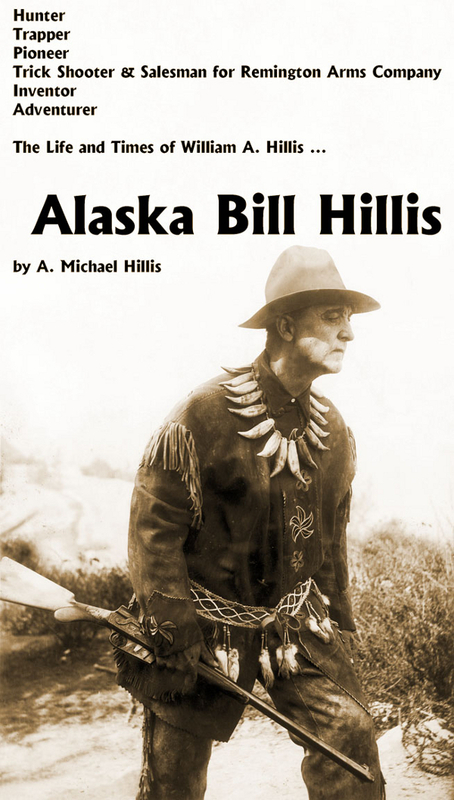 About the most interesting thing connected with Alaska Bill however, is his ivory gun-stock. A bit of history is associated with this curiosity which is really a work of art – and for which Hillis has refused $500, he says. Bill, who knows as much about the Eskimos as any geography, was in Nome, Alaska, last August. While there he saw a band of Eskimos who had crossed the Behring Straits from Siberia. The old chief named Joe luzd a piece of solid ivory about eight inches in diameter and two feet long. He was cutting paper weights from it and selling them at $5 apiece to the crowd. Alaska Bill offered to buy the whole piece, but the old fellow refused. He said he found it in a glacier and that it was a part of a mastodon tusk. Bill went around to the Eskimo’s camp the next day and made the blubber-eaters think he was a spirit by his wonderful shooting. He persuaded Joe to sell him a gunstock. Joe made it and polished it by hand. It has engraved on it the picture of a reindeer sledge drawing an Eskimo through the snow and a walrus on an ice chunk. It is quite heavy. All of Alaska Bill’s shooting is done at flying targets. Using a 30 caliber Remington autoloading rifle, he hits a small tin can in the air six times before it hits the ground. Small discs, nails, two thrown at a time, he picks off easily. He does similar difficult feats with a shotgun and revolver. In actuality, there were 3 or 4 guns that were fitted with the ivory Alaska Bill acquired. The two original pieces were a shotgun and a Model 8 Remington Rifle. The rifle still remains with the Hillis Family. W.A. Hillis of Portland gave a fine exhibition of expert marksmanship at Whittier yesterday before an interested audience, using shotguns, rifles, and pistols of the automatic type with equal facility. A striking feature of his performances is the fact that he throws his own targets in the air for snap shooting and makes practically as good scores as other experts who shoot at objects thrown by an assistant. With an automatic shotgun of 12-gauge, Hillis broke several pairs of Bluerocks, drove a tin can thirty yards through the air with one charge of the magazine, fired five shots in two seconds, smashed five empty shells with one charge of the magazine with damp and burred cartridges, and wound up by making a pattern at fifty yards through which a quail could hardly escape. Using high power ammunition in his autoloading rifles, with the .25-35 he broke single and double brickbats and marbles, punctured single and double disks, shot through holes in the center of washers, and placed four out of five shots in a small block of wood in its two seconds flight. 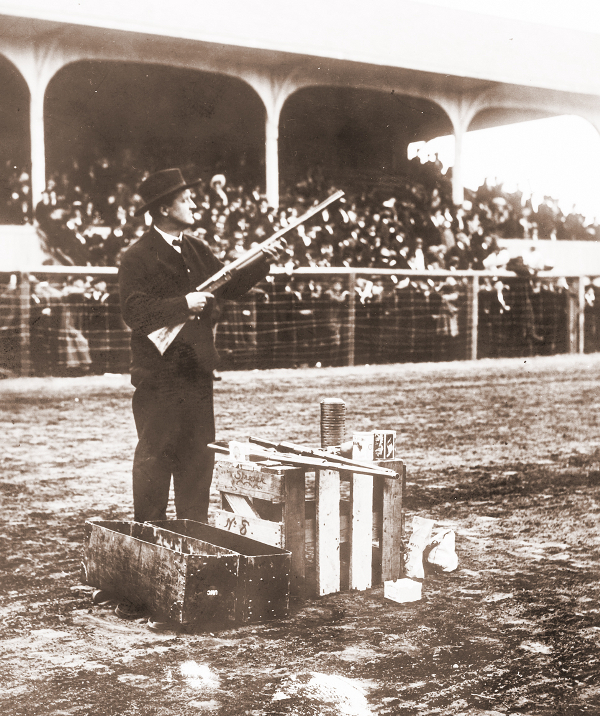 Taking the .30 caliber autoloader, a gun which has been fired 3,500 times, Hillis repeated these feats, besides puncturing a three-eights-inch steel plate, thrown in the air, with soft-nosed bullet, hit a ten-penny nail revolving in the air, and then shot through blade, head and handle of a hatchet with both rifles. With a .22 caliber pump gun using gallery ammunition, he did all sorts of snap and hip shooting, including the, destruction of the tiny .22 shells tossed in air. Despite his many activities in the early 1900s, including travels for Remington, his mining interests and raising a family, Bill’s entrepreneurial drive kept him constantly looking at new horizons. His many years traveling in the snow covered reaches of Alaska resulted in his focus on a more efficient way to travel in that frozen region. He teamed up with an inventor/partner Frank G. Homer and built the predecessor to the snow cat and snowmobile and called it the “Auto Sledge.” This contraption roughly resembled a dog sled without the dogs and was patented in 1918. Earlier in 1917, Bill and his partner tried to market the concept to the War Department with no success. At that point in time, Bill determined that his skills as a hunter and sharpshooter were more marketable than his skills as an inventor. In the 1920s, Bill (in his 60s by then) and his wife Maie, retired to Libby, Montana which Bill had always called home. At that point in his life he focused on raising his family which consisted of three sons: George, Louis and Joe. He spent time teaching each of them to hunt and fish and learn from his many experiences in the wilderness. Interestingly enough, they each experienced their first real hunting with the faithful “Old Betsy,” the .35 Remington Bill made famous in his many hunting adventures. The rifle still remains as a prized possession of the Hillis Family. adventure at a time in our history that will never be duplicated. He died in July 1940 and is buried in his beloved Libby, Montana. The article (above) is excerpted from the full article printed in the 1st Quarter 2009 RSA Journal. The 60-page magazine with the complete article (and numerous photographs not seen here) can be purchased from the Remington Society website.